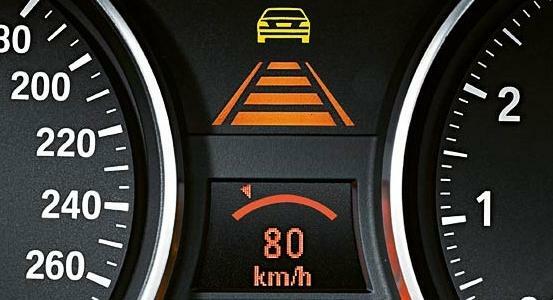 Amazing new features: Active Cruise Control & Adaptive Light Control enhance safety and comfort. A dense traffic flow on the highway. An endless succession of trucks is moving in the right lane. The speed of vehicles in the left lane varies from 90 to 140 km/h, because every now and then a passenger car starts overtaking a truck. The driver behind the wheel of one of the vehicles is very relaxed. His right leg does not press any pedal, neither the accelerator, nor the brake. Nevertheless his BMW is steadily moving in the traffic flow, accelerating and braking automatically when needed. Science fiction, isn't it? Soon it won't sound fictional anymore. Later this year, BMW will launch the system of Active Cruise Control (ACC). This system uses radar to continuously measure the distance to the vehicle ahead, registers the speed and calculates the safe distance in a given situation. And the system maintains the distance automatically. Invented and patented by BMW, the system of Adaptive Light Control (ALC) is already close to the introduction into serial production. It will make a revolution in the car lighting technology. The ALC is able to adapt to various traffic conditions. Separate segments of the headlights are controlled by the navigation system. The system maintains connections with several satellites and always knows where the car is. Thanks to the digital road map recorded on a CD, the system knows the route and the road. Finally, the sensors on the wheels provide information about the vehicle speed. With the help of a small camera, the tomorrow's BMWs will be able to recognize road signs and inform the driver about speed limits, etc. Soon, cameras will even replace the rear-view mirrors. “Blind spots” will stop impairing the driver's visibility. Another camera will watch the edge of the roadway and control the vehicle's trajectory. If the car gets too close to the edge, the Heading Control system will warn the driver about the danger: it will slightly increase the back-pressure on the steering wheel. Infrared cameras, that are currently being tested, track the road direction in the darkness and also allow the driver to see people or animals on the road or next to it long before they're caught in the headlight. The images of the objects detected by the system are projected as a kind of black-and-white film onto the lower part of the windshield, or are displayed on the monitor. But in spite of all the technical refinements, the decision-making rests on the driver. According to Reichert, all the driver aid systems are designed to help the person. They do not have to exonerate the driver from responsibility.